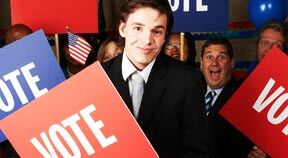 Presidential candidates often use negative campaigning tactics to prove to voters that they are a better fit for the office than their opponent. Negative advertising in a political campaign has been going on for centuries. Presidential election season is well underway, and that means a brutal stream of negative advertisements aimed at each of the candidates in the race. Although negative attacks on presidential candidates have become standard procedure, it’s easy to wonder if a political campaign has any boundaries on what can and can’t be said. Allie Jorgenson, a consultant at Maurice Bonamigo & Associates, says there aren’t really any rules surrounding negative political campaign ads in the presidential election. “When creating negative ads you always have to be careful not to cross the line into slander, but even if that does happen — or the line gets blurred — rarely does one candidate take legal action against another,” Jorgenson says. Often times, a political action committee (PAC) will create the negative ad, so the presidential candidates can stay away from any potentially off-putting marketing tactics, Jorgenson says. If presidential candidates violate campaign rules with negative ads, Jorgenson says the opponent can sue for slander, but that’s not too common. “More often than not, the opponent will take to the media and say how terrible and tacky the ad is, and try to gain public support that way,” Jorgenson says. Pincus says there are also different levels of negative advertising. While negative ads can help presidential candidates, Pincus says there is a calculated risk to using them, as presidential candidates have to be careful not to cross the line and offend voters. Pincus believes voters have gotten used to the negative ads that go along with a political campaign, and have even deemed them as acceptable in recent years. “I think that most voters have become accustomed to negative advertisements being used and they only react negatively if the advertisement crosses a line that it should not have,” Pincus says. Jorgenson agrees that while voters claim to dislike negative political ads, they do work. “A lot of Americans have the idea that campaigns were more gentlemanly in the past, but they really weren’t,” Ostler says. She says the 1800 presidential election between John Adams and Thomas Jefferson is still one of the dirtiest in history, although the presidential candidates themselves didn’t actually campaign. Ostler says many of the same topics that we hear about now in negative political ads —such as corruption, weakness, stupidity, elitism, age, and lack of experience — have always been popular attack topics in campaigns. Ostler says the main difference in negative campaigning today versus in the past is the immediacy of the attacks and the saturation coverage by the media. Ostler believes that while the content of the attacks isn’t much different now than in the past, they feel much more intense because of the constant bombardment from news sources. Throughout the years there have been many extreme examples of negative campaigning, but Ostler says the one that stands out to her the most occurred during the 1938 Al Smith versus Herbert Hoover presidential election campaign, simply because Smith was attacked in so many different ways. Hoover didn’t attack Smith directly, Ostler says, but his supporters did. That’s not all Hoover supporters attacked Smith for. In more recent times, Ostler says many people thought the Willie Horton ads that George H.W. Bush ran against Michael Dukakis the 1988 presidential election reached a new low in mudslinging.